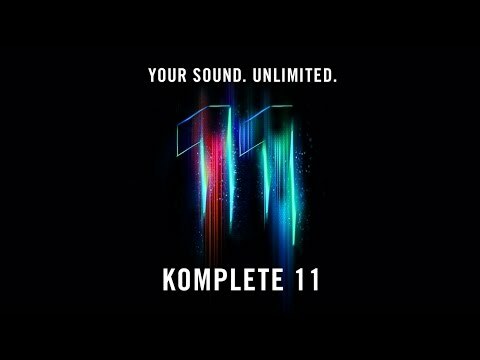 If you have been using a full version of Native Instruments' Komplete 2 to 10 software, but would like to make the jump to the latest Komplete 11 edition, then this is for you. Please note, you must have a valid copy of Komplete 2, 3, 4, 5, 6, 7, 8, 9 or 10 to use this product. Native Instruments' Komplete 11 is the most affordable way to upgrade to the latest and greatest offering from the masters of music production software. Offering a generous 45 full products, over 13,000 sounds to play with, and a huge 155GB of instruments and effects, you have a veritable treasure trove of musical instruments to play with, without having to break the bank. As well as including established synths such as: Reaktor, Massive, Monark, etc., the team at NI have upgraded Komplete 11 to Reaktor 6, as well as including: Una Corda, India, Replika, Strummed Acoustic and Kinetic Metal to the already impressive arsenal of sounds. The latest Reaktor 6 Player includes the ensembles: LazerBass, NewSchool, and much more. As with Komplete 10, this edition integrates seamlessly with the Kontrol S-Series controllers (sold separately). The combination of sumptuous playing feel provided by the S-Series' Fatar keys, combined with a powerful sound engine and immaculately sampled software instruments creates a harmonious writing and recording experience. With unified browsing across all Komplete instruments, tag-based, and directly from the hardware, and pre-mapping to the touch-sensitive controller knobs via Native Map - but a few of many intuitive features -, Komplete 11 and the Kontrol S-Series controllers are quite literally made for each other. As you'd expect, NI's Maschine hardware also communicates beautifully with Komplete 11, so working in combination with S-Series controllers you have the ultimate studio recording hardware/software to create sonic masterpieces with ease. Komplete 11 is home to a range of pristinely sampled instruments including: Drumlab drums and percussion, Scarbee Mark I electric piano, The Gentleman acoustic piano, Vintage Organs, West Africa world instruments, and much more. Whether you're laying down a quick idea and an elaborate piece of work, everything you need is on offer to create an accomplished finished article. Back once again are: Rounds, Kontour, Polyplex, and Session Horns. Incorporating ethereal synth sounds from the ground-breaking Rounds, or highly-reactive Kontour synth, and delicate intricacies of drum kit design in Polyplex - is delightfully simple thanks to the elegant user interface. Supercharger gives you the sweet sound of tube compression, with a host of adjustable parameters that put you in total control. Let your musical imagination run wild! The meticulous team at Native have poured over every aspect of Komplete 10, guaranteeing that the interface is natural to work with as one could hope for. Whether you're a Komplete aficionado, or exploring its wonderful universe for the first time, everyone can very quickly become familiar with the intricacies of the suite. Komplete 11 is compatible with all of the top Digital Audio Workstations including Pro Tools, Logic, Cubase, Ableton Live and more. Therefore, as soon as you've installed the software, you can start incorporating the amazing sounds and effects of Komplete into your work. Installation is nice and simple thanks to Native Access, simply fire up from the included USB flash drive and you're already on your way. 10 GB free disk space / 100 GB for complete installation, DVD drive. Speciﬁc requirements vary depending on the individual program. The applications alone require 10 GB free disk space; the libraries require 90 GB on top. Note that the library size is 130 GB if uncompressed. Several libraries are compressed using advanced KONTAKT Lossless Sample Compression, resulting in a much smaller installation size. All products included within a single edition of KOMPLETE 11 are part of one user license and can only be used as a single entity. A maximum of three installations on three machines are allowed as long as only one installation is used at any given time. The individual products cannot be resold separately. KOMPLETE 11 includes the GUITAR RIG 5 PRO software but not the RIG KONTROL hardware controller. *£22 e-voucher is valid at the NI Online Shop 3 months after KOMPLETE 11 Activation.